It's not suitable for all occasions, but Drumaxx's decidedly different take on digital drums is a breath of fresh air. Sounds great. Fun and easy to program. Flexible synthesis engine. Low CPU usage. Somewhat brief manual. Not especially 'hard' or realistic. The latest product to pad out Image-Line's ever-increasing range of virtual instruments is Drumaxx, a physical modelling-based drum synthesizer with built-in sequencing. Most drum machines use subtractive synthesis (ie, oscillators and filters), samples or a combination of the two, but physical modelling recreates instrument sounds using a mathematical model of a physical sound source - in this case, a drum. Using this, you can edit the physical properties of the drum and the way it's struck, rather than being restricted to sample, filter and envelope settings. The subtle nuances and natural variations between hits in, say, a drum roll, are easily emulated, helping to avoid the recognisable 'machine gun' effect of every hit sounding exactly the same. Drumaxx gives you 16 fully editable drum pads to work with - each of which can be routed to its own output for further mixing and effects processing. These cover the full range of standard drum hits, from bass drums and snares to hi-hats and cymbals, to more exotic-sounding percussion instruments. Behind each drum model is the same synthesis architecture: a modelled drum membrane that vibrates when struck by a mallet. Clicking a drum pad in the top half of the screen brings up the relevant settings for that sound in the Modelling Controls section, which occupies the midsection of the GUI. From here, the physical properties of the drum head, the mallet and the striking action can be modified, enabling you to control parameters such as the membrane material, its thickness, tension and shape. Any of these can then be modulated by MIDI velocity, enabling natural variations in timbre to be performed or programmed. There are also high-, mid- and low-frequency filters, enabling frequencies to be filtered out and resonances controlled or highlighted. The mid-range filter is also attached to an envelope generator, enabling the cutoff point to be modulated when the drum is struck. From these relatively simple controls, it's almost surprising that such a wide range of drum sounds can be synthesized. But Drumaxx has no problem delivering everything from snares and cymbals to glitchy special effects sounds and dance hits. Drumaxx also features a simple 909-style step sequencer. MIDI notes can trigger individual drum pads or entire sequences in, with the exact notes for each being user-definable. Up to 16 patterns can be defined per patch, and the supplied presets come with patterns that are handy for getting a feel for the kits. "Drumaxx has no problem delivering everything from snares and cymbals to glitchy special effects sounds and dance hits." The sequencer itself is an old-school affair with 16 programming buttons shown on the GUI. Select a drum pad to edit its sequence by clicking the buttons: a lit button indicates that a hit will be played at that position. In fact, sequences can be any length from one step to 64, with the Pattern Bar selector used to switch through the additional banks of steps. When triggering patterns via MIDI, the rhythm will play as long as the note is held (or until you release the sustain pedal), which enables some neat improvisations. You can set up multiple patterns for, say, kick, hi-hat and snare rhythms, then mash them up on the fly. Other niceties include swing and tiny velocity sliders next to each step. There's also a simple play/pause button on the interface that can trigger the current sequence without you having to reach for your MIDI controller. Drumaxx's sequencer is well implemented and a neat bonus, although we wouldn't go so far as to say that it's a key selling point. As for Drumaxx's sound quality, things are clean and well defined, with an impressive low end on bass drums and a clear treble on hi-hats and cymbals. The level of realism is quite impressive for completely synthetic drums, although Drumaxx is no competition for decent sample libraries and drum ROMplers. Browsing the preset kits and patterns - which cover a fairly standard range of rock, hip-hop and dance drums - you may start to wonder where Drumaxx fits in, as none of the examples are authentic enough to carry tunes in their respective genres. Despite being more realistic than your average beatbox, the sounds have an unmistakably synthetic quality. The bass drums and snares produced by Drumaxx are fairly restrained and conservative - don't expect huge trance kicks or slammin' hard house snares - while the hi-hats are somewhat more versatile and could slot into a broader range of music genres. It's only when you start experimenting that Drumaxx's hidden potential comes to light: it's far more interesting than just another 909-clone or drum module. Taking the drum presets into slightly more unnatural settings, it quickly becomes apparent that this product's real strength could lie in providing a range of easily programmable, experimental sounds for genres such as IDM, glitch-hop and micro house. Glitchy noise snares, 'thippy' hats and tuned percussion sounds are a breeze for Drumaxx, and along with the immediacy of the step sequencer, it doesn't take long at all before you're coming up with Autechre- and Monolake-style beats and percussion loops. Another useful application of this drum machine could be in creating beats to layer with and bolster existing drums in genres like DnB and dubstep. It could certainly produce more novel results than the usual 808 and 909 kits. We tested Drumaxx on a Windows system and experienced no issues - however, many OS X users have reported serious problems getting Drumaxx to work on their machines, so do give the demo a good go first if you're on a Mac. 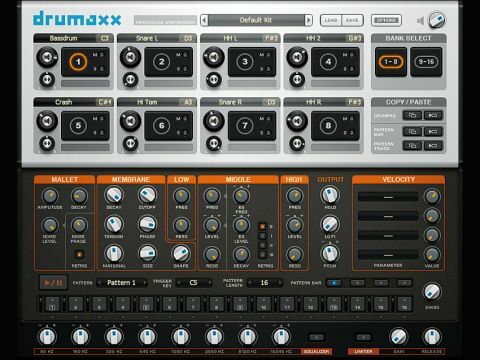 Drumaxx is a great-sounding drum machine with a nicely laid out GUI and a novel approach to drum synthesis. It won't take the place of a real drummer or a set of good drum samples for professional recordings requiring acoustic tubs, nor is it likely to be a main source of beats for use in club music. However, it should appeal to anyone looking for interesting, original percussion for experimental genres, or those seeking the kind of flexibility, customisation and on-the-fly tweakability to which synthesis is ideally suited.